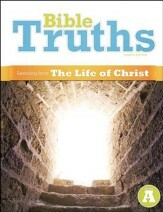 This teacher's edition accompanies BJU Press' sold-separately Bible Truths: Learning from the Life of Christ. Reduced-size student pages are provided for reference. The surrounding margins include an overview with a theme, relevance, and background information. Objectives, a lesson with clear headings and highlighted important truths, outline, and thinking it through answers are included along with "extra" material. The teacher's toolkit CD includes a Bible reading program, exercises with answer key, map exercises, charts, and lesson outlines. 272 pages, spiralbound with soft frontcover and hard backcover. Grade 7. 4th Edition. This resource is also known as Bob Jones Bible Truths: Learning from the Life of Christ Teacher's Guide, 4th Edition, Grade 7. Walk through the New Testament gospels with this workbook on the Life of Christ. Units center around a theme, with individual sections that provide in-depth analysis, relatable stories that help with application, sidebars with interesting information and photos, and focus boxes with a passage to read, verse to memorize, and objective to understand. "Thinking it Through" questions encourage retention of information learned and personal reflection. Units focus on Christ's character, example, experiences, Sermon on the Mount, teachings, miracles, parables, and more. Insight into the New Testament world is featured throughout with biographical and historical sketches. 183 indexed pages, softcover. Level A, Grade 7. This resource is also known as Bob Jones Bible Truths Student Worktext Level A, Grade 7, 4th Edition. Evaluate student progress and comprehension with this set of tests. 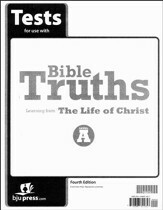 Designed to be used with BJU Press' sold-separately Bible Truths Level A, Grade 7 Worktext, 4th Edition. Glue binding for easy removal. Multiple choice, matching, and Scripture memory questions included. 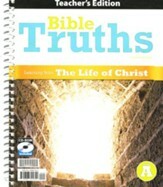 This resource is also known as Bob Jones Bible Truths Tests Packet Level A, Grade 7, 4th Edition. 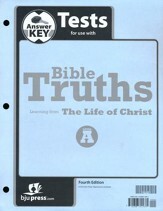 This test answer key accompanies BJU Press' Bible Truths A Tests, 4th Edition. Loose-leaf, three-hole-punched, full-size test reproductions have the correct answers overlaid in italic grey font. Where appropriate, the teacher's guide or student text page where the answers may be found is noted. 7 unit tests. This resource is also known as Bob Jones Bible Truths B Test Answer Key, Grade 8, 4th Edition.